LIGHT THE TORCH and Mark Morton will embark on a co-headline tour this spring. MOON TOOTH will also appear. All dates are below. Tickets go on-sale Friday, 10am local time. VIP packages, which include Meet & Greets with both Mark Morton and LIGHT THE TORCH, are also available beginning Friday. 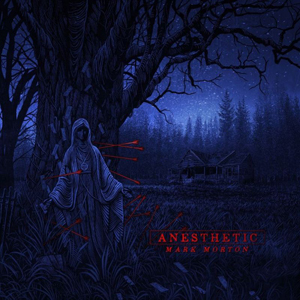 Morton, the prolific guitarist of LAMB OF GOD who will release his debut solo album, Anesthetic (WPP/Spinefarm) on March 1, 2019, while LIGHT THE TORCH continue to support their latest release Revival, out now via Nuclear Blast. "We are beyond excited to hit the road once again in support of Revival, so expect even more new songs in the set this time around," said singer Howard Jones. "We're also stoked to be sharing the stage with Mark Morton on this run. Touring with a true talent and a friend is the recipe for a good time, so come join us! And make sure to get there early to catch MOON TOOTH." "I'm thrilled to announce the first live dates in support of my new album Anesthetic," Morton said. "The response to the new songs has been amazing so far and I'm excited to get them up and running in a live setting. I've got a badass band put together and I’ll be joining up with my friends in LIGHT THE TORCH and MOON TOOTH for these shows. So, get there early and stay late!" The album was made alongside a dream team of highly respected musicians from a multitude of musical worlds; some friends and some who would never be expected to collaborate with metal genre leaders LAMB OF GOD. Singers on the album include Chester Bennington, Randy Blythe, Jacoby Shaddix, Myles Kennedy, Alissa White-Gluz, Mark Lanegan, Chuck Billy, Jake Oni, Josh Todd, Mark Morales, and Naeemah Maddox. Musically, Morton performs all guitars, with Roy Mayorga, David Ellefson, Ray Luzier, Paolo Gregoletto, Alex Bent, Mike Inez, Jean-Paul Gaster, Steve Gorman, Marc Ford, Yanni Papadopoulos, and Chris Brooks rounding out the band. LIGHT THE TORCH — Howard Jones [vocals], Francesco Artusato [guitar], and Ryan Wombacher [bass] — drew from five years together as DEVIL YOU KNOW to forge a wholly distinct path. Amidst myriad struggles, they returned from the brink under a new name. The LIGHT THE TORCH lineup boasts one of the most esteemed pedigrees in modern heavy music. Jones spent a decade at the helm of GRAMMY® Award-nominated and gold-selling titans KILLSWITCH ENGAGE. Artusato had much-lauded stint in ALL SHALL PERISH and has attained status as a shred virtuoso. Wombacher was a staple in BLEEDING THROUGH for well over a decade. For Revival, they are joined by EXTINCTION A.D. drummer Mike "Scuzz" Sciulara behind the kit. The band released Revival via Nuclear Blast in 2018. Since then, the band has embarked on multiple tours, while the single "The Safety of Disbelief" has been racking up spins at SiriusXM's Octane.